To use a plot function other than those included with the software, you can write your own custom plot function that is called at each iteration of the pattern search to create the plot. 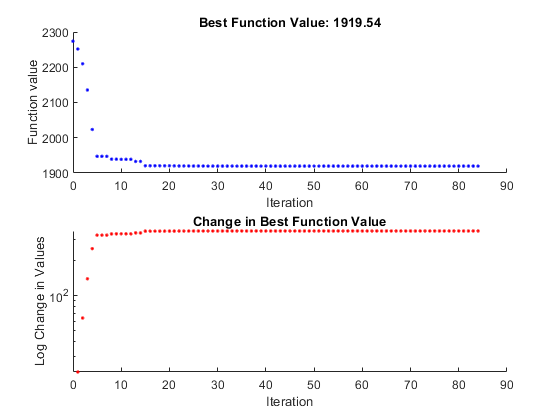 This example shows how to create a plot function that displays the logarithmic change in the best objective function value from the previous iteration to the current iteration. More plot function details are available in Plot Options. % value from the previous iteration. Then save the file as psplotchange.m in a folder on the MATLAB path. Enter optimtool to open the Optimization app. Set up the problem to match the following figure. Since this is a linearly constrained problem, set the Poll method to GSS Positive basis 2N. To use the custom plot function, select Custom function in the Plot functions pane and enter @psplotchange in the field to the right. To compare the custom plot with the best function value plot, also select Best function value. Now, when you run the example, pattern search displays the plots shown in the following figure. Note that because the scale of the y-axis in the lower custom plot is logarithmic, the plot shows only changes that are greater than 0. The most important statements of the custom plot function, psplotchange.m, are summarized in the following table. Creates the persistent variable last_best, the best objective function value in the previous generation. Persistent variables are preserved over multiple calls to the plot function. Sets up the plot before the algorithm starts. Sets best equal to the minimum objective function value. The field optimvalues.fval contains the objective function value in the current iteration. The variable best is the minimum objective function value. For a complete description of the fields of the structure optimvalues, see Structure of the Plot Functions. Sets the variable change to the best objective function value at the previous iteration minus the best objective function value in the current iteration. Plots the variable change at the current objective function value, for the current iteration contained inoptimvalues.iteration.